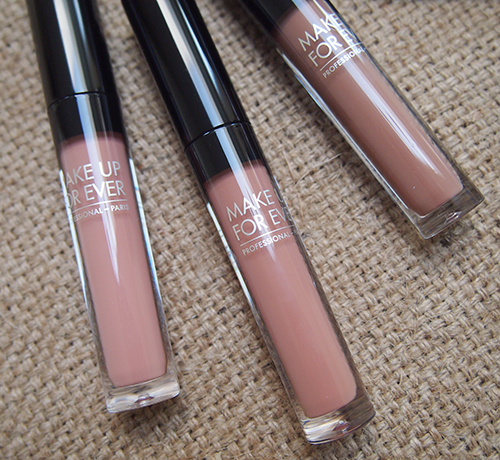 MAKE UP FOR EVER has been churning out quite a few new releases this year and, as always, they showcase the professional MUA-level quality we've all come to expect from the brand while still remaining totally wearable for us regular folks who don't have to worry about actually being camera-ready on the daily. One of my most popular MUFE reviews, for some unknown reason, is of their HD Pressed Powder which came out back in 2014. For 2017, they've revamped the powder to make it compatible with 4K technology and changed the packaging as well. Instead of the round plastic compact, the new Ultra HD Microfinishing Pressed Powder comes housed in a square matte metal compact, similar to the packaging of my Andreja Pejić Eyeshadow Palette (but thankfully with a mirror). There is no sponge applicator included; MUFE recommends that this be applied with their Artisan Brush #160 so it's not exactly the most travel-friendly. I personally apply this right after I do my makeup in the morning and then touch up with my MAC Blot Powder for any shine that surfaces in the day since the finish is only semi-matte. The powder is finely milled and the texture is extremely smooth. Seriously, it feels so nice to the touch but means you'll have to be careful about over-applying so you don't get too cakey. 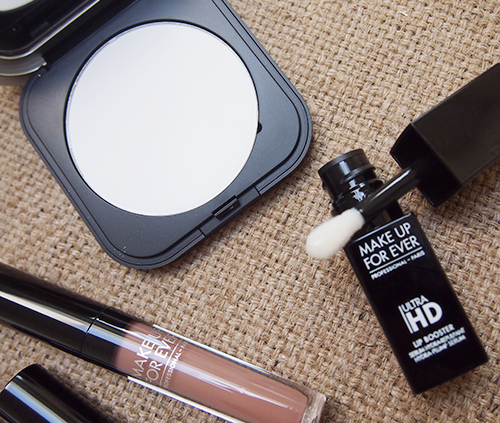 The overall result is a blurring effect to any pores and lines without depositing any colour. However, one warning: if you over-apply, flash photography might make your skin look whiter than a ghost. In fact, you might recall that I expressed some concerns in my last review about the Translucent (1) powder possibly not being suitable for all skin tones (although apparently it is). MUFE appears to have since addressed that issue with the release of two new pressed powder shades -- Banana (2) to finish a medium complexion and Peach (3) to finish a tan complexion, but I can't confirm if flashback is an issue with either as I haven't tried them. 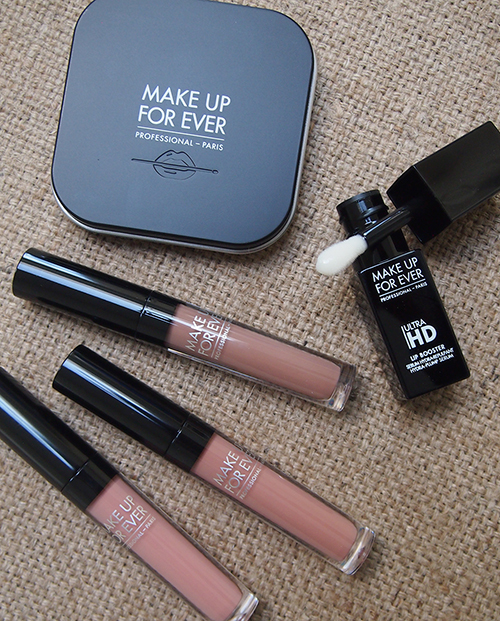 Another addition to the Ultra HD line are the Skin and Lip Boosters. "What on earth is a booster?" you may be thinking. Well, they are basically intensely hydrating serums for your face and lips that are applied before any other product to improve their ability to hold makeup. I was sent the Lip Booster in 00 (Clear) to try out and it works great as a prepping lip mask (apply then wipe off excess product), especially before a matte lipstick. It doesn't really have a discernible scent and instantly adds hydration to dry lips. Speaking of matte lipstick... if you are a fan, you really need to check out the new Artist Liquid Matte line. It seems like every brand these days has some form of matte liquid lipstick but I think these MUFE ones are my faves. The shade range is pretty limited as of right now (there are only six shades and most of them nudes) but since I'm a huge neutral-lover, most of them appealed to me. 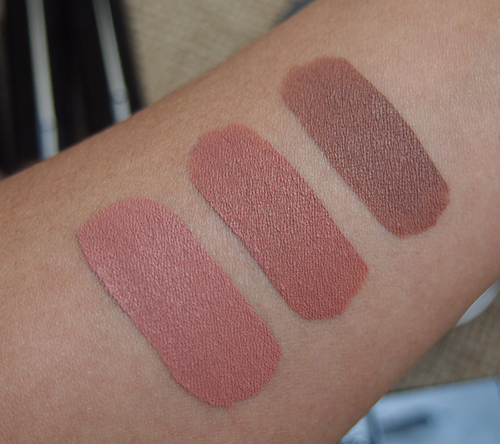 Above, I've swatched 101 (Cream Beige), 103 (Warm Beige), and 107 (Neutral Beige). Give me all the beige!! These liquid lipsticks combine a true matte finish with intense pigmentation, though somehow remain pretty comfortable on the lips. They are also incredibly long-wearing... I had to really scrub to get my swatches off my arm although it was a lot easier when removing from my lips at the end of the day. I love them too! Hope they release a more extensive shade range! These are such wearable liquid lipstick shades! I really enjoy wearing liquid lipsticks as they are just so long lasting. I've heard those are great, I'll have to try! Ohhh I still can't get on the matte lips trend but 107 is a gorgeous shade! It's such a 90s shade!